Let’s not bring clan drama here. Edited posts. As far as im concernd, the main skills for all classes are included. As long as those skills are present, I don’t mind some clairvoyant skills along. There are also other skills that i missed thats for sure. The original post was at the beta sub forum. Had all the skills list. it got removed after the beta ended though. I understand rarity, but this is nearly nonexistent. Servers should at the very least see one in every 10 kills. See even Aileron wanted better drop rates. We should all listen to the man himself! Ailerons opinions were always on point. 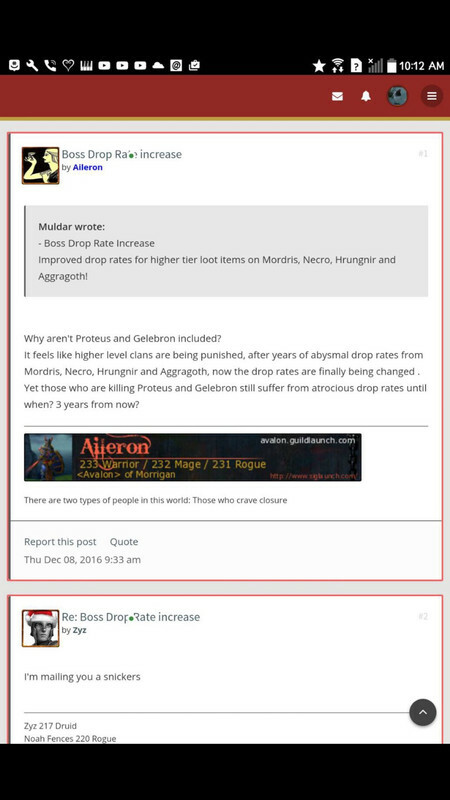 I’m pretty sure that’s the same thread where muldar said that they would adjust Gele/Prot after new end game bosses are introduced. Its very much intentional to keep us killing for one drop for years, but Doch Gul is already doing that to us with Gele/Proteus anyway (pures!) thats it’s ridiculous not to make some adjustment to their loot table (I vote remove mighty/majestics) or at the very least even guarantee a royal + because even royals are rare from these two bosses. As far as everything else about making actual stat changes to the loot ...that can’t happen with a simple reset..we should focus on what CAN be fixed come Monday. We have told otm and VR several times don’t use these cheap tricks instead give us real content they never listen, just leads to a unsatisfied eg playerbase which diminishes heavily overtime. These drop rates will never change as long as this game continues with its current model of raids every two years that require over forty to kill. I've always assumed that OTM never expected this mobile MMO RPG to grow this big, but by the time they realized that people treat this like a console or a PC, game putting in several hours and thousands of dollars they became complacent and unwilling to grow their team to bring out faster updates. It's pretty well known that OTM always cared more about the bottom line than their players, transitioning to a cheaper Thailand base and never growing their team to compensate for the growing player base are prime examples. Don't know how big VR's team is, but if it's similar sized to the Glasgow one with profit over player priority then the game won't have a long term future. OSRS full release in the mobile market on October 30th will be the first nail on the coffin. VR needs to drastically change things around, and like suggested before many times, create in-game or forum polls for changes, listen to the players. Energy boost recast is trash, a recast has no added value, it's like having a dc for sharpen weapons, steady aim etc. Energy harvest is just trash, I don't know anyone that uses it. I can appreciate progress. Player complaints will never end but a step in the right direction is welcomed. Thanks VR. So, otm always said they wont touch up new bosses because theyre too new. Yet you guys touch up bloodthorn and keep gele prot in the dump. Interesting. Its almost like gele and prot will forever be the way they are.